Whole cleaned - Bone, Viscera and skin removed, but tentacles on. 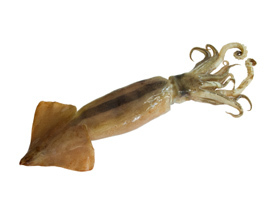 Squid tubes - Only the body meat in a conical form. Squid rings - Cross sectional cuts of tubes in the form of rings with required diameter. Stuffed squid tubes - Tentacles stuffed inside the squid tubes and stitched with spikes ( Small bamboo sticks). Individual blocks wrapped in LDPE sheets and packed in corrugated 5 ply master cartons. Bulk Bags packed in corrugated 5 ply master cartons.